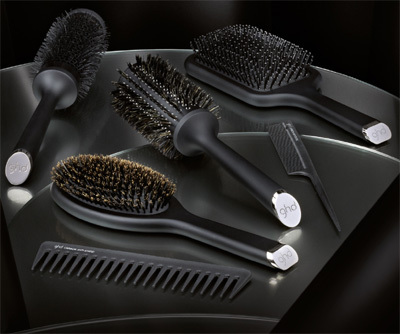 From the people who know styling - ghd, the innovators in heat styling, announce the launch of an extensive new range of salon professional brushes, featuring fourteen beautiful synthetic and natural bristle brushes and styling combs. Developed in conjunction with professional hair stylists and specialist brush makers, the new brushes range has been designed and hand finished exclusively for ghd. The unique brushes and combs are both used and recommended by top stylists all over the world, each featuring a signature platinum toned end cap with a soft touch, non-slip finish for better hair styling control. ghd ambassador, Jayne Wild, says: "Since I received the new brushes I haven't let them out of my sight! They are the essential tools for creating the perfect salon blow-dry look. Each brush is unique so you can achieve all different types of movement and looks for any length of hair and create a smooth foundation for using your ghd styler."